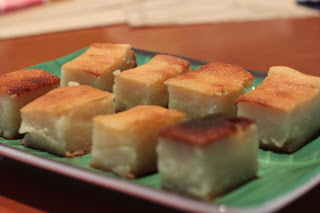 On my last trip to Malaysia, I made sure I had my fill of Nyonya kueh, something which is difficult to find here in Sydney. There are a few places that sell them e.g. Alice's Makan, but it can be pricey. This is an easy to make recipe. I bought the frozen grated cassava from the local Asian store. Texture was a little soft, next time will have to reduce the amount of water. Using frozen cassava may also affect the texture. Must remember to use a smaller tray to get more height. Wendy, thanks again for another great recipe.